As you may have heard, in the grim dark future, there is only war. So what to do when you create a 4X strategy game in the universe of Warhammer 40k? You go all in on that last X, eXterminate. WH40k: Gladius - Relics of War (let's call it Gladius), is the first WH40k game to enter the 4X world of titles like Civilization and Master of Orion. Gladius strips down the classic trappings of the genre to only those elements which make sense in the 40k setting. The most notable feature lacking is any kind of diplomacy. All factions are at war from the start and there are no truces or trade agreements. Other aspects of classic 4X games are here, but streamlined down and serve only to facilitate the production of bigger and better units for the combat which kicks off early and rarely lets up. If I could describe Gladius in the simplest terms possible, I would call it the deathmatch mode of 4X gaming. 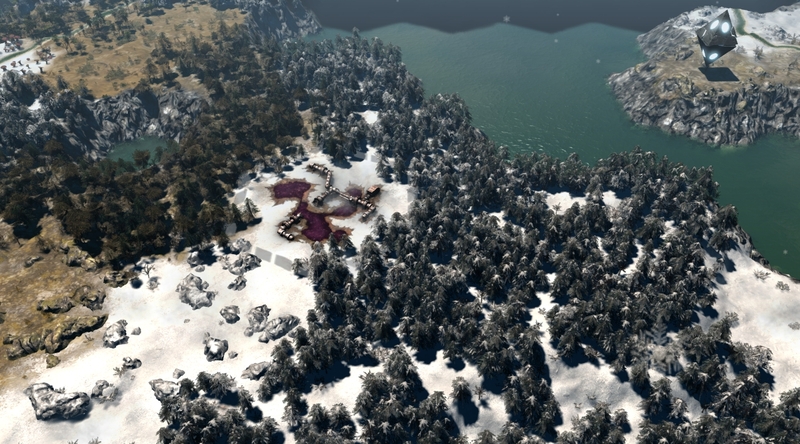 Gladius was developed by Proxy Studios and published by Slitherine Games. The same duo previously created the underrated Pandora: First Contact, which was something of a spiritual successor to Alpha Centauri. Now the team is trying to do something fresh with the 4X genre; instead of adding layers of mechanics and complexity, they are trimming things down to create a fast paced combat focused strategy game. We'll cover each X in turn, leaving the best for last. Whether you're playing as the Space Marines, Orks, Necrons, or Astra Militarum (Imperial Guard), the first thing you will need to do at the start of the game is explore your surroundings. You'll start with a handful of units and the option to place your starting base anywhere you choose. Each hex shaped tile in the game world has different resource bonuses and finite spaces for buildings. Finding some easily defensible terrain is worth considering as well. When playing on the default medium sized map setting, your neighbors will come calling before you know it. The battlefield you will be fighting over is the scarred and ruined remains of Gladius, a planet that was, until recently, a thriving Imperial world covered in cities and loyal followers of the God-Emperor of Mankind. Then a cataclysm of ill fortune hit the world. An Ork invasion, a Necron awakening, and a giant warp storm. All of these events have left the surface of the world an ugly and toxic place. Though there are some surviving patches of green here and there to keep things from getting too bleak. While scouring the landscape, you will find special resource tiles which can be captured to provide a resource bonus and offer your units a defensible outpost in a world filled with dangerous wildlife. The "wildlife" ranges from packs of kroot hounds up to giant guardian automatons and Enslavers, particularly dangerous enemies which can mind control one of your units. With danger comes rewards, however, since the first faction to fight their way through the baddies will find numerous resource boosts and relics which grant various bonuses like passive healing or extra movement to all of the units of whichever faction controls them. As you might expect, you won't be building trade networks or art galleries in Gladius. 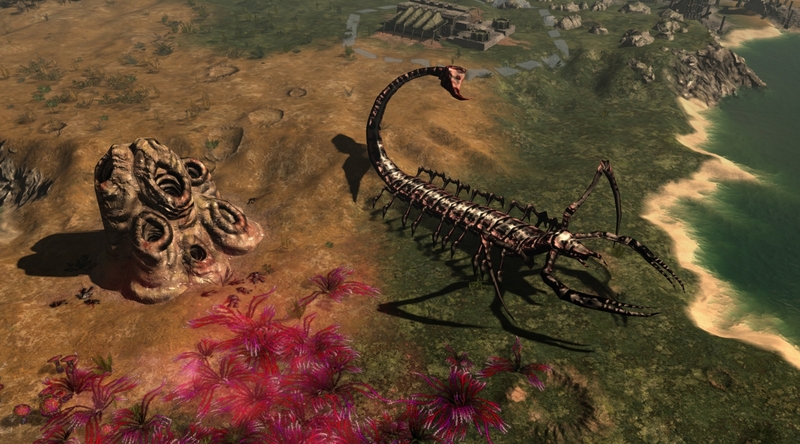 Expansion has only one goal in this game: build bigger deadlier units and more of them. There are several resources to juggle, but the economy is pretty simple. You'll need a bit of everything, so keep an eye on the numbers and build whichever resource building is lacking (in the tile with the highest respective bonus) and you should be golden. Each type of production building you create has its own production queue, so there is little need to create additional cities at the beginning of the game. In fact, the Space Marines can never second city, but instead can occasionally drop down fortresses next to desirable resource nodes. The tech trees in Gladius, the contents of which are completely unique for each faction, are structurally simple. There are ten tiers of research and about a half dozen options in each tier. Research two techs in one tier and you unlock the next. The vast majority of the techs either unlock a unit, building, or combat upgrade, but there are also some resource bonuses and special powers scattered around. This simplicity creates some stark decisions. Do you focus on providing upgrades for your starting grunts, climb the tree to find more powerful and exotic units, or try to build up your war machine? While some other 4X series like Civilization have tried to make combat more of an option than a necessity in recent iterations, Gladius goes all in on warfare. While research and production is streamlined, combat units have detailed stats and options to consider. Units have health, armor, morale, perks, experience levels, sometimes multiple weapons, and so on. All of the variables can be improved through new technologies. For example, the lowly Imperial Guardsmen begin the game at a disadvantage against literally everything else. However, with some researched upgrades, later in the game they can have decent stats and multiple special abilities. All of the favorite units from WH40k lore are here. Dreadnoughts, Killa Kans, Baneblades, and many more all take to the battlefield in a surprisingly short period of time. Where in Civilization, by the time you hit turn 50 you've probably said hello to a couple of neighbors and built a second city, in Gladius you will already be skirmishing with multiple opponents, by turn 100 it's a full scale war that doesn't let up. Whether you find that to be a positive or negative will determine if this is a game for you or not. Combat is very much the meat of the gameplay. I've only played the game on the default map settings so far, and it makes for a real knife fight compared to other 4X games. Three and even four way battles are common sights. It's fun to watch a battle for one of the special resource tiles swing back and forth between two or three factions, as units are destroyed and reinforcements arrive to counter-attack. As the battle rages your units that survive can gain up to ten experience levels, making a battle hardened veteran from the early game a really potent tool in your arsenal. You can give such units a distinct name if you like, creating a bit of extra attachment with them. Hero units in particular can be devastating to lose, since they unlock multiple extra powers and abilities as they level up. Each faction gets three hero types, typically some variations of a warrior, mage, and support. Each hero has three starting abilities to choose from, and a more powerful ability unlocked at level 6. All of these abilities can be upgraded multiple times, allowing you to customize your heroes as you see fit. All of these elements taken together make for a simple, but fun 4X game focused on combat and building cool units. The missions given to each faction give some context to all the fighting, though it wouldn't hurt to see some extra variety there. Each faction always gets the same set of goals, which can railroad some of your early build order decisions if you know what is coming. The game looks very nice for a 4X, with especially good animations and weapon effects. I saw a lot of comments on my preview video from people saying that the game looked too brown and ugly, but I found that most of the randomly generated maps feature a decent amount of green grass and other colorful areas, in addition to the obligatory ruined cities and wastelands. It certainly feels like a world beset by a warp storm and multiple alien invasions. It's a hostile and dangerous place to be for everyone involved. Although the game only features four factions, each is completely distinct and will give you different experiences. Fans of Endless Legends will feel right at home playing factions with radically different mechanics. One really fun mechanic is the Ork "WAAAGH!" meter; keep the fights coming and your units will all get extra attack damage that builds more and more. Each faction has a different starting difficulty rating, and you should pay attention to it. I stubbornly attempted to play as the Imperial Guard several times, despite the HARD difficulty warning, and got my tail kicked on each attempt. Hopefully we'll get to see some more factions added to the game. It would be great to see the Eldar, Tau, and Chaos Space Marines joining the fray, among many others. WH40k: Gladius - Relics of War succeeds at what it sets out to be. This is the arena shooter of 4X games, where combat is the primary focus of each campaign, and moves at a much faster pace than you might expect. Just when you think you're unstoppable, the enemy will show up with a next tier unit and rain on your parade. This creates an enjoyable back forth with fluid front lines. I didn't get a chance to play multiplayer, but I can only imagine that a group of friends would have a fun afternoon exterminating each other. The fast paced turns and relatively simple gameplay mean that you could potentially play an entire match in one long sitting. The drawback of this streamlined approach is of course that the game could suffer from a lack of variety after you've tried out each of the four factions. The winning strategy is always war, never diplomacy, science, or culture, they aren't even an option. This may be a relief for some gamers, however, who just want a good fight and not to worry about establishing the most efficient trade routes or converting others to your religion (this is 40k, you purge anyone who isn't your religion with gratuitous violence!). For those players, I can safely recommend this game if they are at all interested in the setting. For myself, I have enjoyed all the time I've spent with the game so far, and haven't managed to win just yet, so I'll be heading back out there shortly to claim Gladius for myself. Warhammer 40k: Gladius - Relics of War releases July 12th on Steam and GoG. The regular price is $45, but you can get a 10% discount if you hurry. The GoG version comes with a free copy of WH40k: Rites of War if you pick it up before July 26th!